What are you guys giving your ring bearer as a gift? Mine is 3.5 years old. My flower girl is also 3.5 and I got her a necklace with her first initial engraved on it and a small pearl to match my necklace. She’s obsessed with jewelry and then she has something to wear on the big day. For him I just don’t know! Is it ok to just get him a toy or should I get him a keep sake? Any advice is helpful! I think A necklace with his initials would be nice for him also. I’ve seen some really cute ideas on Pinterest for “Ring Security”. The parents may not appreciate a nerf gun for a 3 yo but maybe a water gun, cool shades, something police themed? Or if he won’t know the difference, something small and a keepsake like this from Etsy. 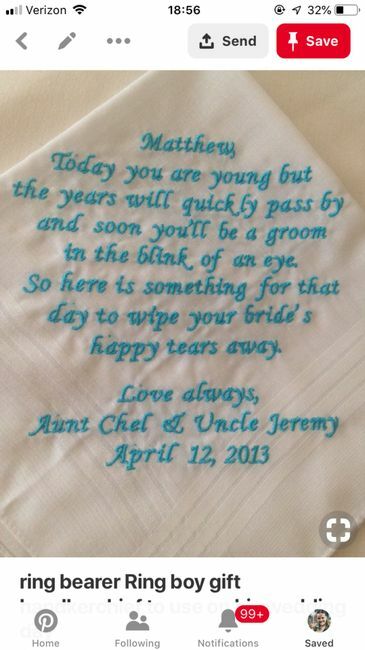 My ring bearer will be 12 mo so I’m just doing this keepsake if anything at all. Mine is a big baseball fan so we’re getting a baseball in a glass case stitched with his name, ring bearer, and the wedding date. Check out Etsy and search for ring bearer gifts - there are some good options there. I am doing a cool toy, for 3.5 Ring Bearer, that I his parents can’t afford to get. Not sure yet. But the little box will have some trucks and “Harry Potter” things. Like the first book with and inscription to him. I have sisters that are 3.5 & 6.5 as flower girls. I will do a couple barbies and then the boom for each girl. As well as a little robe. My RB was 3 years old. 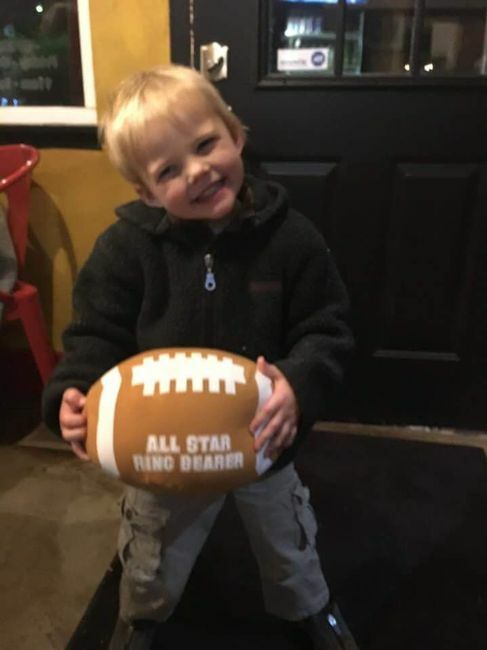 I gave him an activity book about being a ring bearer and a cute plush football that said "All Star Ring Bearer." Daughter gave her ring bearers lego sets.... Not "sentimental," but the kids loved them.